Monstaliner roll-on truck bed liner sets a new standard for do-it-yourself installation and costs just a fraction of spray installed bed liners. Why should I choose to use Monstaliner? How long does Monstaliner take to install? Can I use my truck right away? What about the drain holes in my bed? Will they still be open? How thick does Monstaliner go on? What kind of warranty does Monstaliner offer? How soon can Monstaliner be exposed to rain? Will the bed feel hotter than the rest of my truck? Can Monstaliner be used as an undercoating? What other applications can Monstaliner be used for? Will Monstaliner withstand temperature extremes? Will Monstaliner hold up to weather and rugged conditions? Do I need to remove my tailgate and hardware? Can I use sandpaper instead of the supplied abrasive pads? Can I use regular mineral spirits to wipe down the bed? What should I do if my bed is rusted? Am I better off applying Monstaliner outdoors or in my garage? I like texture but not very rough like some rubber filled products. I have Herculiner in my bed. Can I coat over it with Monstaliner? I want to spray Monstaliner. What do I need to know? Can I wait overnight to apply the 2nd coat? What is Monstaliner made from? containers does it come in? Does Monstaliner come in colors other than black? What’s the average cost for dealer installed spray-on bed liner? What surfaces will Monstaliner bond to? What’s the shelf life of Monstaliner? How can I remove Monstaliner once it's applied? What happens if I get Monstaliner on my hands? How long does it take Monstaliner to dry? How thick should it be applied? Can I apply Monstaliner in the winter? What’s included in the Monstaliner kit? Why are there 3 rollers in the kit? What’s not included in the kit that will be needed to do the job? If you've done your bed liner homework, you know that spray-in liners get costly and most paint type liners must be sprayed or they just don't look right. Monstaliner is the first UV permanent coating specifically developed and fully optimized for installation by roller. Consistent surface texture from start to finish makes Monstaliner the #1 choice for do-it-yourself installers. High grade ceramic reinforcement creates an impenetrable barrier against moisture and corrosion and Monstaliner contains no crumb rubber which competitive products use to create texture and as cheap filler. Monstaliner is guaranteed not to chalk, fade or discolor for a minimum of 5 years and it never needs any topcoats, sealants or protectants to maintain or restore its appearance. A complete do-it-yourself installation should take a total of 6 to 9 hours including 3 to 5 hours drying time between coats. Total working time not including down time for drying is approximately 3 to 4 hours. No, Monstaliner should dry at least 8 hours or preferably overnight before driving vehicle. Allow 3 days for light use of the bed, 7 days for normal use. What about the drain holes in my bed? Will they still be open? Yes, one of the advantages of Monstaliner over plastic drop-in bed liners is that it maintains your truck's factory-designed drainage system. Drop-ins often retain water and can trap ice in the winter. Monstaliner is installed using special rollers included with the kit. Truck bed is first cleaned and scuffed. Coating is then mixed and roller installed in 2 heavy coats. Monstaliner has been engineered to withstand years of heavy duty use. It is flexible and impact resistant and designed not to crack, flake or peel. It is unaffected by sun so it won't fade, chalk or discolor. Monstaliner is also resistant to damage from gasoline and most chemicals and solvents. Monstaliner is guaranteed not to fade, chalk or discolor under normal exposure to sunlight (UV) for a period of 5 years. We also warranty the product against faulty manufacture and defective materials. Since the products use, application and surface preparation methods are beyond our control, we cannot accept liability for application or use of the product. Our sole responsibility under this guarantee in connection with the sale and use of this material, shall be the return of the purchase price of the material or optionally, replacement of the material, if proven defective. Neither labor costs nor any consequential damages are covered by this warranty. Yes, Monstaliner is easily repaired. If you damage your installation, repair kits are available at a reasonable cost and include free shipping. Avoid getting a fresh Monstaliner installation wet for 12 hours following the final coat. Some moisture will actually help accelerate the curing process and you can even gently mist down the surface 12 hours after the final coat is applied. No, due to the fact that Monstaliner forms a direct bond to the surface of your truck bed, allowing efficient heat transfer it will actually feel cooler than the metal on your truck on a hot day. Yes. It is recommended for spray installation as an undercoating. Monstaliner can be applied to virtually any properly prepared surface for durable and long-lasting protection. Grille guards and bumpers, rocker panels, fender flares, and floor wells are just some examples. Monstaliner can also be used on trailers, ATVs, tractors, boats, dog kennels and anything else that will benefit from outstanding protection and corrosion resistance. Yes, Monstaliner complies with all environmental regulations. The product does have a small amount of solvent which evaporates as the coating cures. Monstaliner is designed to provide permanent protection for your vehicle and is not removable. Yes, Monstaliner is rated to withstand temperatures from subzero to 190°F while providing maximum protection and corrosion resistance. Absolutely! Monstaliner has been engineered not to crack, fade or discolor due to sunlight, weather or other environmental factors. Unlike plastic drop-in liners, Monstaliner forms a complete and impervious moisture barrier to withstand heavy-duty use while protecting your truck against abrasion, damage and corrosion. Monstaliner is truly the “World's Toughest Do-It-Yourself Coating”. We do advise removing all hardware and your tailgate. It makes for a much cleaner job and easier taping of the gate. You will likely need a set of “Torx” Bits to remove some bolts and hardware. Allow the coating to dry overnight before re-installing the hardware and tailgate. Yes, you can use sandpaper as coarse as 60 grit but be careful not to sand through the paint. The supplied abrasive pads will also work well under a vibrating palm sander. Mineral spirits is not strong enough to remove all wax and grease without great effort. We prefer MEK to be used for the most effective wax removal. Acetone also works well but evaporates too fast and is more flammable and dangerous to use. Stick with MEK. You'll find it at Lowes, Home Depot and most paint stores. Wash and clean the bed. Allow to dry. Scrape and remove any loose or flaking rust and paint. Prep the remainder of the bed as explained in the Installation Guide. Solvent wipe all rusted areas with MEK. Prime rusted areas with two coats of Magnet Paints Chassis Saver™ #934 Silver-Aluminum Rust Preventive Paint. After the second coat, allow Chassis Saver to dry overnight and proceed with your Monstaliner installation. Indoor installation is best – Just make sure that you have good ventilation and good lighting when working indoors. Surface prep can be done outdoors and then move vehicle indoors to apply coating. Don’t take short cuts … Monstaliner is capable of providing a truly professional looking finish that will look almost sprayed. Avoid windy, outdoor conditions that could ruin your installation with leaves, bugs or debris blowing into the coating. Then Monstaliner is exactly the product for you! With over 4 years of development and testing, Monstaliner is crumb rubber free and has the most unique texture on the market created exclusively by the application rollers. It's not too rough and it looks similar to molded plastic and is unlike anything ever seen that wasn't sprayed or baked on. We don't recommend it. The solvent in Monstaliner can cause swelling of the rubber particles in the Herculiner especially on an older installation. If this happens, the Monstaliner can start lifting off while taking the Herculiner off with it. Contact Monstaliner technical support for a recommended sealer to be applied over the Herculiner to prevent any lifting problems. You'll need an inexpensive undercoating gun commonly called a “Shutz” and access to an air compressor. You must cover the entire vehicle to protect from overspray. When you tape off your edges, attach plastic drop cloths or masking paper under the back side of the tape so the protective material can hang down over the outer sides of the bed to the ground. Cover the entire vehicle regardless of how neat you think you are. Follow all precautions involved when using automotive paints and isocyanates. A respirator must be worn while spraying. Yes, just install the 2nd coat within the next 36 hours. Surface preparation will take the most time and energy. Installing Monstaliner is a great weekend project. If you do your surface prep late in the day you should stop and get up early to install both coats the next day at once. Try doing the prep on a Friday after work and install coating on Saturday. This will give you all day Sunday to smile and show off the results. Monstaliner is made from military grade, UV permanent, highly cross linked aliphatic polymers and moisture impermeable ceramic reinforcement. Monstaliner is manufactured and currently sold direct by Magnet Paints. As stocking dealers are added, a list of locations will be included on our web site. Call 1-800-922-9981 to place an order. How much does Monstaliner cost and in what size containers does it come in? Monstaliner is packed in a 2 gallon D.I.Y. kit including surface preparation and installation tools. The coating and catalyst are also sold separately in 1 gallon units and the installation tool kit is sold separately. Contact Magnet Paint customer service for pricing. Monstaliner will be available in additional colors. A release date has not yet been set. Colors will be priced higher than standard black. $400.00 to over $1000.00 is the typical range. There are many different products and dealers offering bed liner spray-on services. Final thickness, UV resistance, skid resistant properties, and costs will vary widely. Monstaliner will bond to most clean/dry surfaces, including painted or primed steel, wood and fiberglass. Prepping the surface is critical for best results. See the “Installation Guide” included with the kit. Unopened cans and kits of Monstaliner can be stored for 12 months. You can use MEK, Xylene or acetone while the product is still wet, but if it dries, it's permanent. Paint remover will remove dried Monstaliner but must be used with care since it will also damage many underlying surfaces. If you get Monstaliner on painted areas of your vehicle just rub gently using a soft cloth wet with MEK or acetone. A small amount of gentle rubbing compound will also remove drips, smudges or splashes of coating. Re-wax areas after solvent cleaning. Skin contact is not harmful but should be avoided. Clean skin immediately with MEK, Xylene or acetone then wash thoroughly with soap and water. Remove from skin at once to avoid temporary staining. Do not attempt to remove dried Monstaliner from skin with solvent; soak in warm, soapy water. Once product has stained skin, only time will remove it. Your first coat will dry to recoat in 3 to 5 hours depending on temperature and humidity. After the second (final) coat, your bed will be ready for light service in 24 hours. Allow 3 days for light, non-abusive use and 7 days for full cure and normal use. Since Monstaliner is a moisture curing urethane, the curing process begins when the catalyst is added and the coating is exposed to atmospheric moisture. Therefore, with higher humidity, curing time is shorter. Warmer temperatures will also accelerate cure time verses colder temperature lengthening cure time. The complete Monstaliner kit is designed to be applied in 2 heavy coats at a combined dry film thickness of 40+ mils. The goal when beginning an installation is to complete the bed and have no leftover coating. The kit contains 2 full gallons of coating and is more than enough to complete any 6 or 8-foot bed. Monstaliner is considered a combustible liquid (flash point above 100° F). After drying it is completely non flammable and non combustible. Yes, Monstaliner can be applied in the winter but cures best between 50 and 90° F. Colder temperatures and lower humidity will lengthen the curing process. Additionally, Monstaliner MUST BE APPLIED IN A WELL VENTILATED AREA. If possible, the coating should be allowed to cure indoors at a minimum of 55°F in a ventilated garage or warehouse. If application is done outdoors, move vehicle indoors after application to provide a warmer curing environment. 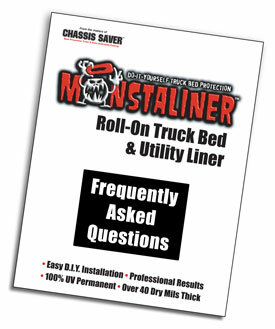 What’s the difference between Monstaliner and other do-it-yourself bed liners? Monstaliner is 100% UV Permanent and contains no ground tire rubber which other products use for texture and as cheap filler. Monstaliner is formulated from military grade urethane polymers similar to adhesives used in aerospace. High grade ceramic reinforcement creates an impenetrable barrier to moisture and provides outstanding impact and corrosion resistance. Monstaliner carries a 5 year warranty against fading and loss of color and is engineered to last and look great long after competitive products have failed. What’s the difference between Monstaliner and spray-in bed liners? The major difference is cost followed by dry film thickness. Monstaliner costs about 1/3 the price of most spray installations and is designed for the do-it-yourself market to achieve truly professional results at significant savings. The dry film thickness of Monstaliner is about 1/3 that of many spray-in products but provides more than enough protection for 90% of all trucks on or off the road. 2 full gallons of protective coating (including catalyst), 3 application texture rollers, 2 coarse abrasive pads for scuffing & prepping bed, 50 ft roll of low-tack masking tape, 1 roller handle, 1 paint brush for tight spots, corners and seams, 1 power drill mixing paddle, 8 solvent resistant nitrile gloves, 2 wooden mixing sticks, 2 disposable roller pans, detailed Installation Guide, material safety data sheet, registration post card. One Quart of MEK, garden hose with spray nozzle, TSP (trisodium phosphate), clean rags, broom, scrap cardboard, power drill, protective eye wear, respirator mask (if working indoors), 4 to 6 foot screw tip pole (very helpful), knee pads. © 2009 - 2015, Magnet Paint & Shellac Co., Inc.
All brand names, trademarks and registered trademarks appearing in this advertisement are the property of their respective owners.